The Show Me How Feature of CameraRC Deluxe provides guided instructions on setting up many camera operations. 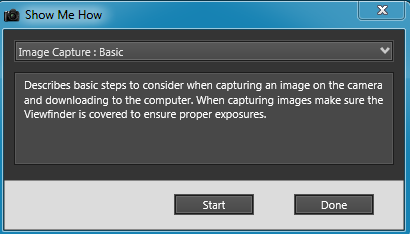 To use, select Show Me How from the Help Menu on the Camera Control Panel. Note that there must be a camera connected to use the Show Me How. From the top drop down box select a topic and then click Start. The program will describe a setting to make to the camera and will highlight that control in the CameraRC Deluxe interface. You can use the Next and Previous buttons that will be presented to move between the steps in the setup. When you have completed press the Done button or Close the window.